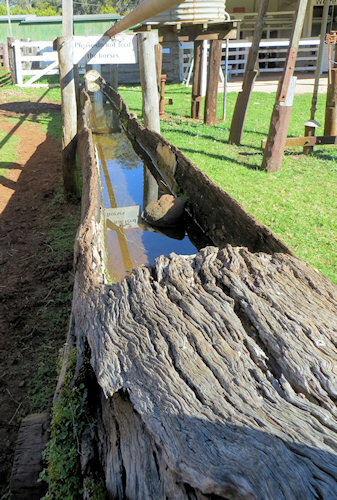 Hollowed out tree trucks make great water troughs – and they are free. I’ll bet there are many still in use today. When I travel I love going to museums – but recently I found myself going to a museum near my old home town in Queensland. It was like looking back into my own past. The thing about remote and rural communities is that they don’t change quickly. Whether it’s Australia, or the UK or anywhere else in the world, rural communities tend to be pretty self-sufficient. They have to be. Even in the 21st century, someone in a remote community can’t just drive up the road to buy a new… whatever. And of course, farming communities survive at the whim of the weather and the economy – so as often as not, even if a new ‘whatever’ is available, it’s too expensive. So farmers tend to make do. They repair and modify and eke out the life of their machinery and tools and household items. 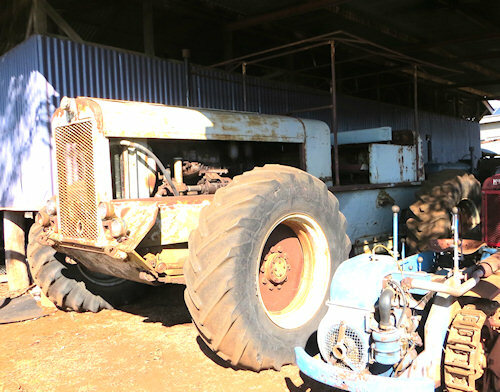 Farmers have the wherewithal to repair a damaged item – they often don’t have the money to replace it. This big blue machine came from a farm near my old home. A friend’s father modified it to keep it working. My older brother even remembers driving it once – about forty years ago. And of course, Australia is a young country, so its pioneer past is not all that distant. These two things combined made my visit to the Highfields Pioneer Village quite special. The organisation has collected together buildings, farm machinery and household items – all taken from the area where I grew up. Most of the items were a bit before my time … but seemed familiar none-the-less. 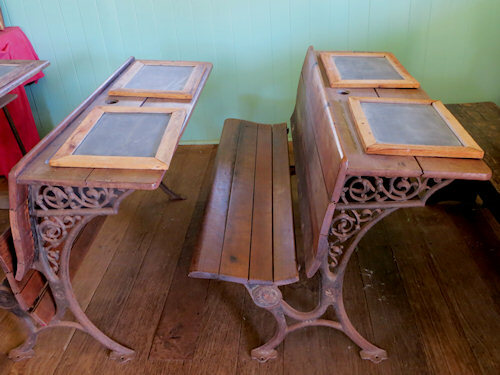 Our old primary school had desks very much like this. We didn’t use slates, but I remember the ink wells. When a school desk or a building is in use for decades, it collects a lot of memories. That’s what I found at the park. Memories. 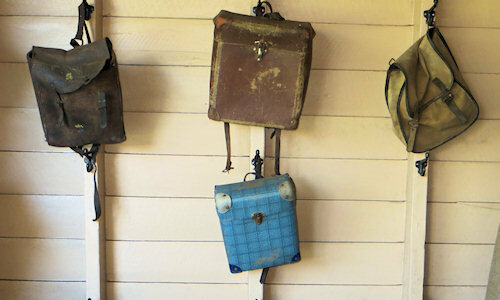 Bags hanging on the schoolroom wall. I had a well-used version of the blue one. but I think it was a different colour. 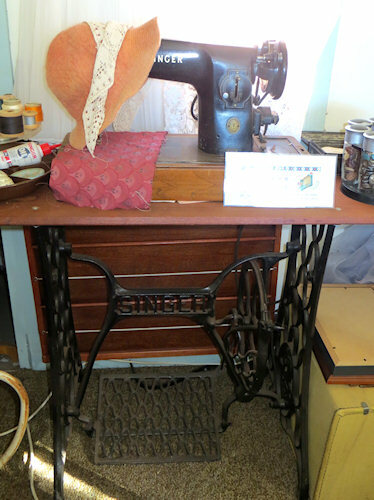 My mother had a pedal-powered sewing machine – a later model than this. It was a special treat for me to be allowed to use it. Some of the memories were mine. Some just seemed to hover around the exhibits waiting for a visitor to be willing to share them. Maybe this is a kind of race memory. I’m not old enough to have used most of the exhibits – but they felt familiar because I grew up with the next generation of exactly the same thing – old and well used tools, modified and repaired household good that were not yet ready to be thrown away. I love museums because they are preserving our past. I loved this museum – because it’s preserving MY past. In these days of modern consumerism and the throw away nature of so much that we own, I have to wonder how many of the next generation’s memories will last long enough to become part of a museum. 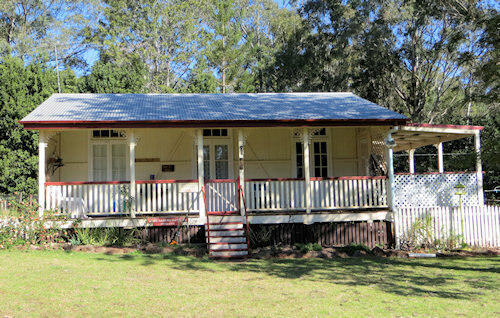 Cottages like this are worthy of a museum – but a lot of people still live in them too. Thanks for your great post, Janet. I too enjoy visiting museums and at the Welsh Folk Museum at St Fagan’s a couple of years back, spotted several items I remembered from childhood. I think my favourite aunt went on using a flat iron long after the electric ones came on the market. I’m counting down to my Australia trip now but it’s to Victoria, not your patch!